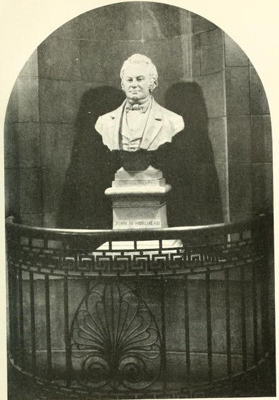 Description: John Motley Morehead was the first governor to serve in the Capitol for a full term from 1840-1845, is portrayed in this marble bust, which sits in the rotunda of the North Carolina Capitol building. The corners of Morehead's mouth are turned slightly upwards as if he is about to smile; he wears a high-collared shirt, a vest, and jacket complete with bow tie. Sponsor: The bust was donated by Morehead's grandsons, John Motley Morehead and J. Lindsay Patterson. Unveiling & Dedication: R.D.W. Connor, J. Brian Grimes, and the J.Y. Joyner (Superintendent of Public Instruction) all gave addresses at the dedication. Subject notes: John Motley Morehead, a UNC alumnus, was the governor of North Carolina from 1841 to 1848. He was known for his contribution in the construction of the railroad systems in North Carolina and for his advocacy of public education. Landscape: The bust is located in the North Carolina Sate Capitol building in the rotunda on the first floor of the building. The bust accompanies nine other plaques and busts which are located around the rotunda; a 1970 copy of Antonio Canova's original statue of George Washington sits in the center.